Takagawa Kaku (高川格, September 1915 - November 1986) was a Japanese, 9-dan, professional Go player. He changed his name to Takagawa Shukaku (高川秀格) after he won the Honinbo title for the first time. The highlight of Takagawa's career was his unexpected win of the Honinbo title against Hashimoto Utaro in 1952, and subsequent defense of the title for the following eight years. The importance of his victories were four-fold. 4. Takagawa's first victory brought the title back to the Nihon Ki-in from the newly fractured Kansai Ki-in, thereby impacting the political landscape between the two organizations. His record for the Honinbo title stood for 38-years until Cho Chikun broke it in 1998. In 1954, Takagawa had his most successful year. He defended the Honinbo title by defeating challenger Sugiuchi Masao, won the Oza title by defeating Miyashita Shuyo and the Nihon Ki-in Championship by defeating Shinohara Masami. This made him the first professional to hold three titles simultaneously. Throughout his career he also faced Sakata Eio in over a dozen tournament finals and would develop a healthy rivalry from the late 1950s-60s. He could also claim to have briefly bested Go Seigen in two of their famed, multi-game matches. 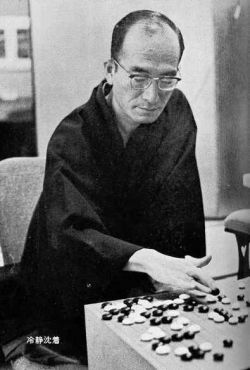 In 1968, he was awarded the 6th Shusai Prize for outstanding player of the year. In total he won 17-titles, and was a runner-up for 17. 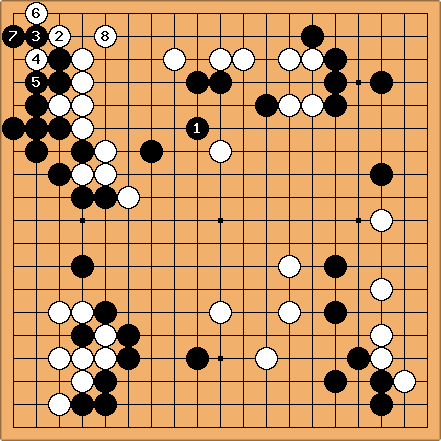 Takagawa's style revolved around thick plays that enabled a constant flow of exchanges around the board. He attempted to embody the motto: "Flowing water does not compete for first place." As such, he preferred peaceful exchanges and avoided head-on confrontations whenever they were judged sufficient enough to keep him in the game. He utilized his thickness by creating a long, drawn out game where he could steadily squeeze his opponent's groups for small advantages. Often, this would result in a crop of center territory emerging in the late game. Additionally, his thickness would limit an opponent from beginning too many fights (i.e. his thickness would become an advantage in the fight), and would allow Takagawa the flexibility to make exchanges instead of battling head-on. His means for building thickness would be in his early joseki choices and playing of honte moves. Regarding Takagawa's personal assessment, he said: "My go manifests itself in some ways in my liking for Shuei. Basically, it is rational go. It emphasises balance based on counting. I hang on closely in the opening, middle game and endgame and try to sustain thickness and keep on counting to the very end." His non-confrontational method of using thickness and avoidance of complex fights would occasionally irk and unsettle players whom had more direct go styles or personalities. Honinbo Shusai was noted as saying that Takagawa played "rustic go," but could still expect to attain 4-dan by the age of 20. Hashimoto Utaro sarcastically described Takagawa's style as "flowing like water -- lukewarm water." It was enough for Takagawa to find moves that were 'not bad', instead of competing for every point. It was even said that ultimately Hashimoto's loss of the 1952 Honinbo match was a psychological one. He notes, "it was unbelievable how Takagawa could play such lukewarm moves; I just couldn't get used to it." Speaking of Takagawa, I genuinely consider him a past master of competitive match play. I realize that he has said the same of me, but in reality he, if anyone, deserves the distinction. Outwardly Takagawa appeared weak and fragile, yet his inner spirit was powerful and unyielding. He was tough psychologically as few others are, and even now I have much to learn from that side of his personality. But he also possessed an unerring instinct for evaluating the true state of affairs throughout the board. He was perfectly willing to allow his opponent to take a key point on the board as long as he had the opportunity to take an equally good point. When the time came for middle-game fighting, Takagawa would not go out of his way to start a fight; in fact, as far as possible he would avoid fighting. Rather, he sought to draw out the game, confident in his endgame skills. Of course, at times he would find it expedient to abandon this passive strategy for the rough-and-tumble fighting natural to go, but he would only do so if the natural balance of the game had already been upset. Where Takagawa really excelled was in his ability to defuse an opponent's natural fighting spirit. He approached the game dispassionately, determined not to provoke a confrontation. Most people instinctively defend themselves when faced with imminent danger, but Takagawa, always cool and reserved, was never in a hurry to act. He counted on neutralizing his adversary's strengths and then letting him destroy himself through overeagerness. He encouraged his opponents to strike impulsively. To the casual observer, Takagawa appeared to be a scholarly type, devoid of serious ambitions, but nothing could have been further from the truth. He was simply a realist. Compared to players like Fujisawa Shuko and myself, who rely on intuition to achieve success, Takagawa prepared much more comprehensively; he avoided the wild mood swings, the intuitive jabs, and concentrated on his own winning plan. A Master of Komi Go? The reasons for Takagawa's wins against other strong contenders of his day initially left analysts stumped. However, towards the end and after his Honinbo streak professionals began to attribute his early success to his grasp of komi go. His play as White and Black differed noticeably and played a critical role in many of his wins. As such, many historians and professionals have subsequently attributed Takagawa as the first professional to have mastered komi go. One aspect of his play that contributed to this was his extreme 'number' based play. Takagawa's method of making continuous exchanges throughout the game required heavy counting during almost all moments -- in order to properly assess the positional value of his moves. Simply put, his positional judgement was based upon an extreme counting style that, therefore, always put him within intimate awareness of the exact territory balance. This, for him, is what led to his mastery of komi go. Takagawa was a noted admirer of Honinbo Shuei. He was introduced to Shuei by a copy of collected games his teacher, Mitsuhara Itaro, gave to him while he was going through a period of inner turmoil. The games impressed him so much that he was able to refocus his life back onto go. When I was young I often enjoyed playing over the games of Shuei. That was because I liked the image of him winning without doing anything at all unreasonable. But today I wonder: did I really understand Shuei to that extent? In doing the commentaries for this book, I perused his collected games again after a long interval, and again was made to sigh in admiration at his strength. In particular his games as White after he reached 7-dan hide a fathomless strength amidst a serene and well-balanced flow, which we can perhaps describe as flexible on the outside, unbendable on the inside. In brief, the characteristic of Shuei’s skill at go is not just about local things such as his skill at evaluating positions or his skill in seeing moves, but his mastery of go itself. Go World Iss. 41, "A Champion for All Seasons: Takagawa Kaku." Go World Iss. 41, "Takagawa's Artistry with Thickness." Modern Master Games Vol. 1, p. 87. The Magnificent Obsession: Sakata Eio and Go (2), Go World Iss. 52, p. 45. A 16-page biography, "A Champion for All Seasons: Takagawa Kaku," was presented in Go World iss. 41 (the year following his retirement). An English, short-film called, "Personalities of Today. No. 5 - Shukaku Takagawa" was produced in 1977. It was available for many years for loan from Japanese embassies and consulates.